(Reuters) - Graduating seniors at Bethune-Cookman University in Florida turned their backs in protest of U.S. Education Secretary Betsy DeVos at the start of her commencement speech on Wednesday at the historically black institution. Boos and jeers could be heard as DeVos, who drew ire in February when she said historically black colleges were "pioneers" of educational choice, was introduced. Faculty and school administrators on stage stood and applauded. Live video of the ceremony in Daytona Beach showed many graduates facing away from DeVos, though it was not clear how many of the approximately 300 seniors participated in the silent protest. "One of the hallmarks of higher education and of democracy is the ability to converse with and learn from those with whom we disagree," DeVos told the graduates. The university's president, Edison Jackson, interrupted her speech with a warning to students. "If this behavior continues, your degrees will be mailed to you," he said. "Choose which way you want to go." Ahead of the speech, students, alumni and political activists sought to have DeVos' invitation rescinded, saying they were offended by her earlier comment. DeVos, who is a proponent of school choice - including charter schools and school vouchers - later clarified her remark, noting that historically black colleges were created because other institutions were not open to African-Americans. About 60,000 signatures on two petitions were delivered to school officials on Tuesday objecting to her appearance at the university. 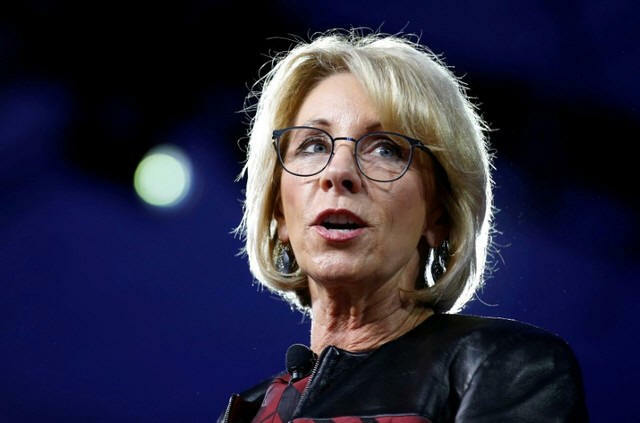 In a statement on Sunday, President Donald Trump said DeVos chose Bethune-Cookman for her first commencement address as education secretary to show the Republican administration's dedication to the mission of historically black colleges and universities. Jackson, an African-American and a Republican, and some others defended the choice of DeVos as the graduation speaker for the school, which was named for black educator and civil rights activist Mary McLeod Bethune. Sean P. Jackson, chairman of the Black Republican Caucus of Florida, said DeVos had long been a champion of providing strong education opportunities for minority students. "The secretary says we should allow charter schools to come in and educate children if they are doing a better job than the public schools," Jackson said on Tuesday.